Decorating your home can be fun. There are so many fun ways to make your house feel like home. Easy ways that take minutes,dollars and just a little bit of your time. Best of all using items you find around at home. 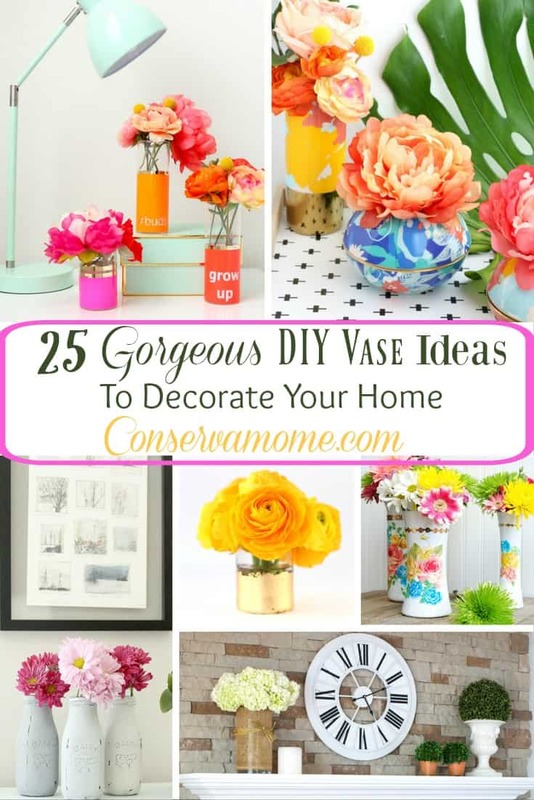 So check out this fun round up of 25 Gorgeous DIY Vase Ideas To Decorate Your Home that will make any flower, real or fake stand out. Make sure and check them all out to get some fun ideas, create each one or grab the best of each one to incorporate into one fun project. Enjoy! Those are a lot of great ways to reuse containers. These are pretty! There’s lots of fun ideas here! I love little DIY decorations like these! Thanks for sharing these beautiful ideas. I am going to put together a couple of painted Mason jars with some orange and cream pip berries for fall. These are awesome! I will definitely have to try and make some. Would be great for Mother’s Day instead of just flowers for mom, a hand decorated vase too. These are great! Anytime I have aneed for a vase I can’t seem to put my hands on one. So cute! I’m enjoying your DIY posts! These are beautiful! I need some more vases besides the standard Mason jars I have around the house. These are such great ideas and now I want to go decorate! What fun and creative ideas. I like being able to reuse items to decorate and there are so many ways here. Love the gold foil vase!!! Seriously so gorgeous!! These are so pretty! My niece will have a great time helping me with this project. We will have so much fun!